[Stephen Albers] offers his avian friends a lot of extras with this electronically monitored bird house. This will not only give you a look at what’s going on inside, but provide a source for several other bits of data as well. First off, a camera has been mounted to the underside of the roof. This looks down on the nesting area and features night vision so that you can peek in any time day or night. He used a WiFi webcam that operates separately from the other electronics. With the remainder of the setup he is able to harvest temperature and humidity data inside, temperature outside, force on the bottom of the house (although this turned out to be less useful than anticipated), and a in-and-out count for the doorway provided by an IR transmitter/receiver pair. This offers quite a bit more than the last bird house project we saw. That one also left a lot to be desired as far as protecting the electronics. [Stephen] didn’t skip on that kind of protection. Most of the electronics are housed in an acrylic chamber in the base of the house. The sensors find themselves nestled in plastic enclosures, although some work needs to be done to ensure that the temperature and humidity sensors will still function correctly with this setup. 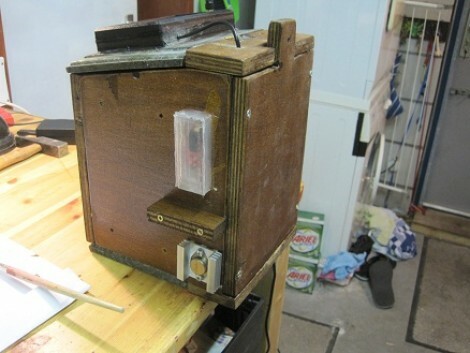 This bird house will tweet to let you know when the occupants pass through the door… err… hole. 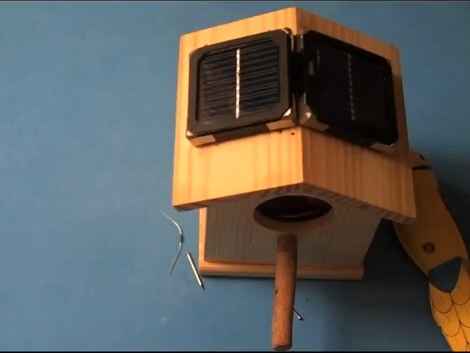 It uses solar panels to keep a battery topped off, and an Arduino along with an optical sensor which monitors the doorway to pass along an alert via an XBee module. Admittedly, the video after the break is a bit tongue-in-cheek and doesn’t safeguard against the elements, or even against bird poop. AND it’s basically an advertisement for B-Squares. But we still like it. These squares use magnetic corners to connect the solar squares together, as well as the squares that house the Arduino and the battery. These magnetic corners also act as the power and ground rails. Two nails have been pounded through the roof of the bird house, acting as a surface to magnetically attach the solar panels to, as well as a conductor to pass the power rails through the wood. It’s no wonder that B-Squares are closing in on raising five-times their Kickstarter goal.